Nadiya Hussain creates dishes to complement any kind of day. Nadiya's quick dishes include a super speedy spin on prawn toast and a simple apple rocky road recipe. Nadiya Hussain shows us how to create the perfect dishes to compliment any kind of day. Whether it is a treat day, a family trip or a lazy weekend, Nadiya makes tasty and nourishing recipes that will bring smiles to the faces of everyone. Today's quick yet delicious manic weekday dishes are mango and lime lassi bircher, a super quick spin on prawn toast, seafood crumble and a speedy and simple apple rocky road recipe that will knock your socks off. 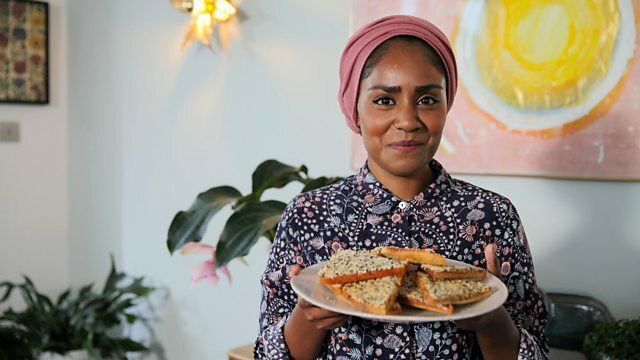 Nadiya's love for the simplicity of cereal takes her to the world's first cereal cafe in London, and her appreciation for the beauty of bread lands her amid passionate baker Heather's Bread Baking Club. So, pop the kettle on, make yourself comfy and let Nadiya show you her family's favourite recipes.